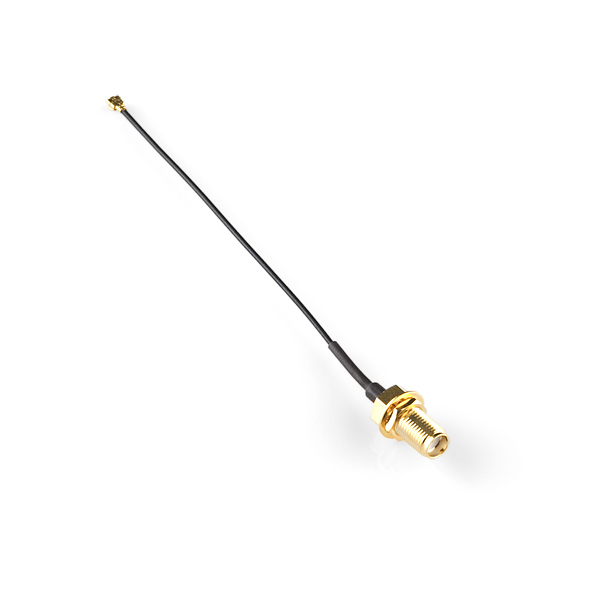 Does this antenna operate on the 2.4Ghz band and is it ideal for the XBee 1mW U.FL Connection - Series 1 (WRL-08666)? 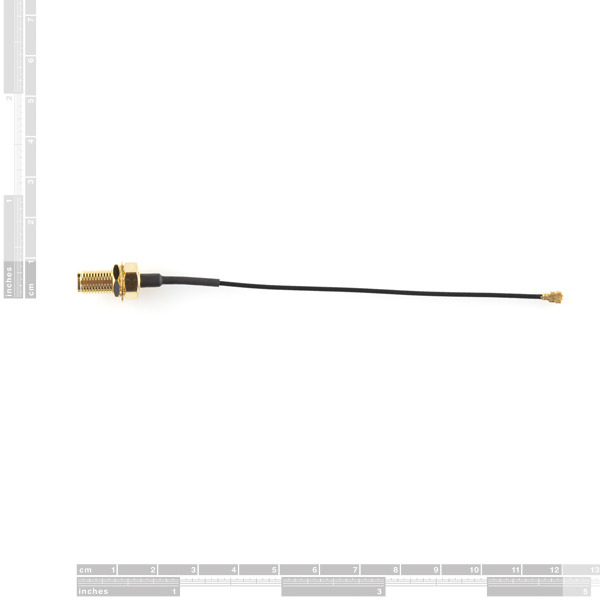 This is not an antenna, it is just an adapter cable that lets you use an SMA antenna with a module that only has a u.FL connection. But it will work with the XBee u.FL modules. Are the SMA connectors waterproof? How are people mounting this to a PCB? Are there any angle brackets suitable for PCBs? I don't have an enclosure to mount the bulk head directly to. I'm confused. Is this the cable I need to connect my WiFly shield to an antenna like the black one in my PC's Wi-Fi card? Or do I need the other one sold here (WRL-00662)? Please, help. If this is the Wifly shield you have, then yes, this is the correct cable to connect the module to an external antenna that has an SMA connector on it. 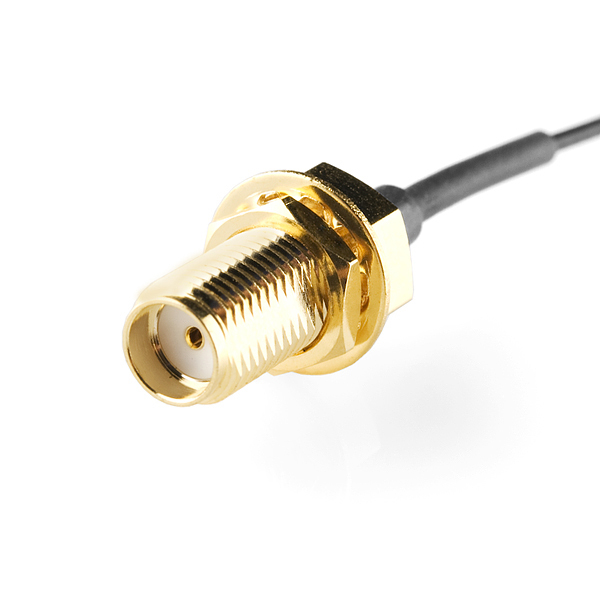 The RP-SMA interface cable would also work, but would require an external antenna with an RP-SMA connection. Anybody know if there is a source for a replacement U.FL connector on this? Seems ridiculous to have to buy a whole new cable if the connector goes bad. You probably want the RPSMA version I got caught by this!! Sparkfun - Can you add a warning in flashing ink? This interface can be use for the XBee Pro 900 XSC U.FL? this model of xbee dont have antenna, that antenna can be used? You are correct. This is the adapter cable we recommend for the U.FL Xbees. This interface can be used to connect a video signal? SMA and u.fl is traditionally for antennas. I don't think it would be suitable. You need a 75 ohm cable. There are numerous options specifically for video transmission. According to the tutorial this cable has a old school female SMA. This is because there is no pin in the center of the connector and the threading is exposed. A female RP-SMA would still have the threading exposed but would have a pin in the center (lousy FCC). SOMETHING HERE IS WRONG. The photo and description do not match. In the photo, there is a U.FL plug (female tines) on one end and an SMA REVERSE POLARITY Female connector on the other. However, the description clearly believes that this is not the case. The linked datasheet agrees with the PHOTO, not the description (actually it is not entirely clear since it is a multipart number drawing). Easy to way to install antennae connector to enclosure, good build quality, just be careful with that small connector.